In creating a bright and spacious interior design of the room, leaving the possibility of its zoning, glass partitions are appropriate. They give the opportunity to retire, while not cluttering your space, give a feeling of lightness and freedom. Due to this, they simultaneously provide beauty and comfort, as well as perfectly absorb noise. Mainly used in commercial buildings such as shopping malls, exhibitions, shops, supermarkets, banks, pharmacies, offices, hotels, reception areas, restaurants, and others. But gradually glass partitions begin to occur in apartments, private houses, cottages, emphasizing the individuality of the interior. Interior glass partitions transform the surrounding space, make it more light and airy. Partitions of glass are deaf, fixed, sliding with door mechanisms and pendulum with pendulum doors. Characteristic For this kind of designs used a strong fire-resistant glass, which is completely safe, is not subject to rot and rust, easy to clean, allows light and does not transmit sound for decades keeps an attractive appearance. Adequate level of sound insulation, as well as being in an open and well-lit space, improves productivity, because it helps employees focus on the implementation of the goals and objectives helps to improve mood and increase efficiency. Glass constructions allow to make a small office more spacious and comfortable due to multiple reflection of light rays. Glass partitions are different in type and form. In addition, glass partitions have a variety of design options. They can be transparent, matte, tinted, combined, and also have decorative inserts. Thus, each company can choose an option that fits the interior of the office and corresponds to the layout features. For example, to maintain the image of the company on glass partitions in offices, its logo or other company symbols are applied. The shape can be manufactured directly and curved glass, which can be a smooth curved or a broken line. Construction fastened to the floor, wall or ceiling mounts on point or joint to joint. 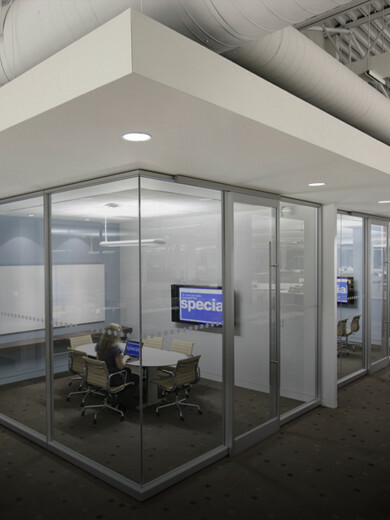 To connect or divide the room into sections, a sliding glass construction with modules is used, allowing you to create an office or a resting place at the right time. With the help of partitions from glass, there are negotiation rooms, rooms for employees, halls and much more. Sliding glass partitions make it possible to differentiate space without damaging daylight, they are mobile - they can be easily and quickly disassembled, they can be re-installed elsewhere. For example, when companies move to another address, glass partitions are transported and installed in the new office without any problems, saving the budget. Qualified specialists perform dismantling and assembly of such structures during the day. Standard web thickness at 10 cm fully ensures safety of the structure. glass mounting systems also have high durability and reliability, capable of withstanding the incredible burden, despite the fact that the glass is considered a fragile product. This glass practically does not lend itself to destruction, and in case of breaking it does not create dangerous sharp fragments, since the surface is protected by a special film, which prevents the scattering of fragments. Thus, sliding glass partitions have many advantages and are recommended for use not only in commercial, but also in residential premises. There are not many shortcomings, but they do exist. This constant presence of personnel for all to see that not all people like, as well as the rapid contamination of glass that requires careful and frequent care.